Note: Building long-term power in our communities is what PeoplesHub.org is about. New online trainings and workshops launch April 2, designed to get local groups working strategically and inclusively, building power that is independent of any political party. It’s no secret that many voters are ticked off with the Democratic Party. By more than two to one, Americans believe the party is out of touch with the concerns of most people, according to a 2017 Washington Post/ABC Poll. Think superdelegates; DNC leaders who sided with Hillary Clinton at the expense of the Bernie Sanders campaign; compromises with the corporate elite; and behaviors that seem to disparage black folks, young people, and so-called deplorables. Nonetheless, recent special elections show that the Democratic base is on fire, mobilizing, voting, and winning. The stakes couldn’t be higher. Climate crisis, money in politics, DACA, white supremacy, the future of the internet, gun safety, health care, public lands, regulation of the banking industry, civil liberties, and so much more are all being contested. With the entire House of Representatives, a third of the Senate, and many governors and state legislators up for election, much will be determined in the midterms. So, in spite of disquiet with party leadership, many are already working hard for Democratic candidates. And some are doing this work in a way that builds independent power—power that can also be used to hold elected officials accountable, work for the long-term well-being of their communities, and take stands on issues the major parties’ elites may or may not support. These folks are using the excitement and widespread engagement that comes with a high-stakes election to build local organizations that are independent of the party organizations. This strategy offers the possibility for remaking the Democratic Party (in ways that roughly parallel what the Tea Party did to the Republican Party) starting from the bottom up. But even more importantly, it offers the possibility of building a power base that can help remake the country. I spoke to two luminaries in the world of organizing to learn how to make this strategy work: One is Heather Booth, who is the founder of iconic organizing school Midwest Academy; an activist for tax justice, marriage equality, women’s rights and civil rights; and (full disclosure) a member of the advisory board of PeoplesHub, an organization I founded. The other is Dan Cantor, national director of the Working Families Party, which works in 17 states on electing progressive leaders and building grassroots power. Here’s what I learned from them that resonates with my own experience as a local activist. First, build your local organization. Join and support an existing group that fits with your values, if one exists, or start a new one. Consider affiliating with a national organization such as Indivisible, Working Families Party, or Our Revolution. As you knock on doors, attend rallies, and in other ways support your favorite candidate, also build your own group’s power by expanding your email list, network, volunteer base, and skills. Reach out to people you know, and also ask who else has shared interests and, especially, who is left out? In an era when racial and class inequality is widespread, it’s important that movements put economically disenfranchised groups at the center of their organizing strategies. Organizers should learn about the issues that are important to other segments of their community and meet leaders in local politics, civic organizations, and businesses. Third, share power and build cohesion. Fourth, make no small plans. Set goals that are inspiring but achievable. “You attract many more people if you’ve got a credible plan that people believe is a winnable plan. Design that from the start,” Booth said. Fifth, build public awareness and name recognition. Sixth, create your own agenda. What values and issues are most important to you and to others in the diverse communities that make up your town or city? Work together to set your agenda. Then question candidates about which of your priorities they will support. Today, that might include federally funded health care, which a majority of Americans favor. But the Democratic Party establishment has for years refused to consider this option. If that’s important to your group, ask candidates if they will cosponsor a “Medicare for All” bill in Congress. If not, consider running another candidate against them in the primary. Seventh, recognize that this is a long-term process. “It has taken us a long time to get as weak as we are. Corporations have been in the saddle and riding mankind for decades,” Cantor points out. By building local organization, the impact of our work is cumulative—each time we mobilize around a candidate or issue, we can increase long-term local power. Eighth, start local, but then connect with other groups and other communities. Together, locally based groups can galvanize enough power to counter the influence of big corporations and outside money. “It doesn’t take you long to get to the point where you’re screening local candidates for Congress,” Cantor said. This doesn’t mean you will always win—but you will prevail much more often, and if you pick your fights, those can be important wins. Ninth, once your candidates are elected, hold them accountable. Elected officials hear from lobbyists all the time, he pointed out. They need to hear from you, too. And if someone really abandons his or her commitments, challenge them in the primary. “You only have to do that every now and then for that to send a message,” Cantor said. It would be easy to get swept up in the immediate demands of a high-stakes election. If we want fresh ideas and new initiatives, though—if we want to lift up the voices of those left out, and to put the interests of ordinary people, instead of corporations, front and center—we’ll need our own organizations. We can build long-term power in our communities and also help elect our favorite candidates if we work strategically, inclusively—and independently. Sarah van Gelder wrote this article for YES! Magazine. 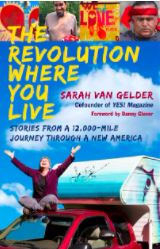 Sarah is a co-founder of YES!, founder of PeoplesHub, and author of “The Revolution Where You Live: Stories from a 12,000-Mile Journey Through a New America.” Read more about her work here, and follow her on Twitter @sarahvangelder. 1) Adequate and sufficient techniques-methods in Nonviolent communication(NVC) to support people with interpersonal competence. 2) An explicit ecumenical spiritual “frame” or platform plank. If you can’t get leadership to do this, see if consesnsus exists around George Lakoff’s polarity of Stern Father vs. Nurturing Parent. Okay to contact me. I have training materials and scripts.